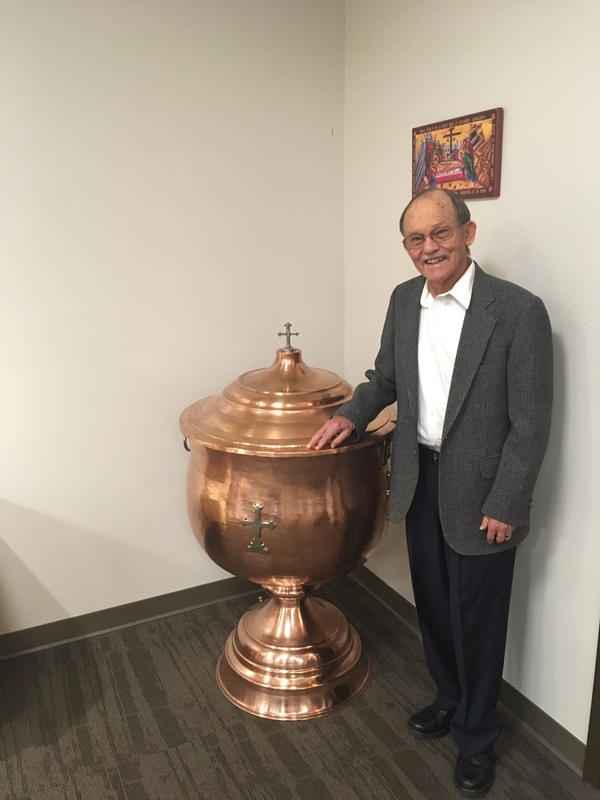 WAUWATOSA, WI - The Holy Apostles Orthodox Christian Church of Cheyenne has been gifted a baptismal font by the Saints Constantine and Helen Greek Orthodox Church in Wauwatosa, Wisconsin. The donation was orchestrated by Father James Kordaris, Director of the Greek Orthodox Archdiocese Office of Stewardship, Outreach and Evangelism. Reverend Presbyter Panteleimon Dalianis, Presiding Priest of Saints Constantine and Helen, was very happy to facilitate the donation and wished Holy Apostles all the best while adding, "May the font get lots of use!" The font has an extensive history at the parish and is quite historic. It will certainly be taken care of in its new home in Cheyenne. As of October 25, 2018 we have an exciting update regarding the baptismal font renovation project overseen by Jim Haefele. A great deal of specialized work has been done in an effort to preserve and restore this font. Jim developed a plan several months ago on how best to move forward with this project. Initially, the extra plumbing features that were added on throughout the years were removed and a new sturdy system was installed that would allow for easy drainage. As a result of the removal, some holes were exposed, but were quickly plugged using copper sheets in a manner that is both extremely sturdy and virtually invisible. Next, Jim fashioned a latch and secured a small portal on the bottom of the font which was needed for the drainage system. After years of exposure, the copper became significantly tarnished, as so often does with this type of metal, but that was nothing some concentrated polish and a whole lot of elbow grease couldn't remedy. Jim again took charge and restored the outter copper surface to the original condition. The font looks incredible and is sturdy as ever. We look forward to having this historic font for many, many years as we welcome newcomers into the Orthodox Christian Faith! Jim undertook this project with such care and dedication, we are tremendously grateful! The restoration project of the baptismal font has been completed and as of October 28th, the feast of the Holy Protection of the Theotokos, the font sits in the nave of our chapel. Greetings to you, as we rejoice in our Lord and Savior Jesus Christ. Please accept our most sincere and gracious sentiments of gratitude for your exceedingly kind and generous offering of your baptismal font. We understand the significance of such a gift and we will be certain to take care and maintain this historic and special baptismal font. As we seek to continue to grow as a mission parish and spread the Holy Orthodox Faith to this region, your history has become our story as well and we thank you for helping us in our sacred mission to “Go forth and make disciples of all nations.” If ever you are traveling through Cheyenne, we look forward to meeting and welcoming you to our small mission parish, and now, a small mission parish with a beautiful and special baptismal font.